Home Tags Posts tagged with "somali arts"
Somali poet, playwright and songwriter Warsame Shire Awale has been killed in the capital, Mogadishu by unknown gunmen near his home on Monday evening. Warsame Shire Awale wrote and acted in radio plays critical of the militant group, al-Shabab, who he accused of misleading people in the name of Islam. The National Union of Somali Journalists says he had received death threats because of his work and songs calling for people to join the police. Warsame Shire Awale had contributed to the Somali arts scene for more than 30 years. He also worked for Radio Kulmiye and had recently become popular with young Somalis who enjoyed his comic plays urging them to reject violence and join those working for the UN-backed government. He had long been a member of the police band, renowned before the civil war for its performances – and had in more recent times been writing tunes encouraging people to join the struggling police force. 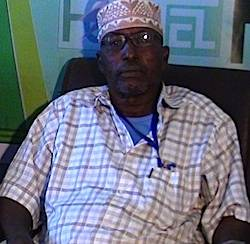 Warsame Shire Awale, who was in his 60s, is the 18th person to have worked in the media to be killed this year in Somalia. Al-Shabab has claimed responsibility for killing more than 10 journalists this year. One of them was beheaded in Mogadishu. The group was expelled from Mogadishu more than a year ago by African Union troops and the Somali army but its al-Qaeda-aligned fighters still launch frequent attacks in the city. Since the overthrow of President Siad Barre in 1991, Somalia has seen clan-based warlords, Islamist militants and its neighbors all battling for control of the country.